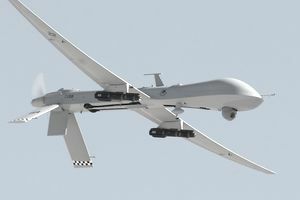 The MQ-1 Predator Unmanned Aerial Vehicle is one of the most widely used pieces of military equipment in service today. Developed by General Atomics of San Diego, California, the MQ-1 Predator is an unmanned aerial vehicle (UAV), which means that it is an aircraft operated without a pilot. Because the aircraft lacks a pilot, it is sometimes called a "drone" by soldiers and politicians. Referred to by the U.S. military as a "system," the Predator actually consists of four air vehicles with sensors, satellite communications, and a ground control station that is used to help operate the unmanned aerial vehicles. Initially designed for reconnaissance missions, the Predator is also armed with Hellfire missiles and can serve a combat role. Since coming into service in 1995, Predator UAVs have been used in several conflicts ranging from Bosnia and Pakistan to Iraq and Afghanistan. MQ-1 Predator UAV systems are expensive at a cost of about $5 million each. However, the aircraft has proven useful in current military operations. Military commanders praise the Predators for their endurance and ability to operate for long periods of time. Typically, a Predator aircraft can travel as far as 400 nautical miles from its base camp and stay airborne over a designated area for more than 10 hours before returning. This has made the Predator ideal for reconnaissance missions and intelligence gathering. The longest recorded flight by a Predator aircraft was 40 hours. Unmanned Aerial Vehicles also keep pilots out of harm’s way. However, the aircraft has run into problems in bad weather conditions. Several early versions of the Predators crashed due to icy conditions – drawing criticism from some politicians. These problems have since been corrected with a de-icing system. Developed With Input From the C.I.A. Although primarily used by the U.S. military, the Central Intelligence Agency (C.I.A) has had an active interest in the MQ-1 Predator UAV since its inception. The C.I.A. has been developing aerial drones for reconnaissance and intelligence gathering since the 1980s. The C.I.A. helped oversee some of the early test flights and training involving the Predator system, and the agency has actively used the aircraft for some of its foreign operations – notably in the Balkans. Other countries have also expressed interest in using the Predator system for military operations, including Canada.